French Bible commentator; lived at Toulouse in the first half of the eleventh century. He is often quoted by Rashi in his commentary on the Pentateuch, and is twice mentioned in a commentary on the Maḥzor (Cod. Munich, No. 346) in connection with an explanation of Zeph. iii. 1 and of an expression of Eliezer ha-Ḳalir's quoted by Menahem of Ḥelbo. 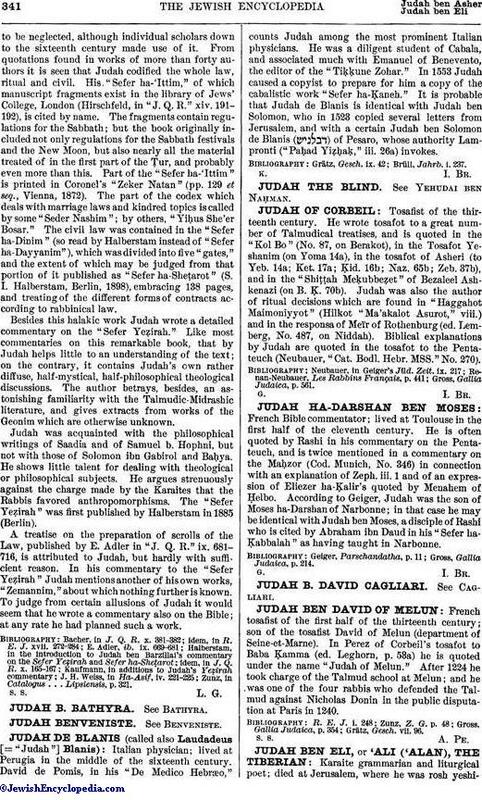 According to Geiger, Judah was the son of Moses ha-Darshan of Narbonne; in that case he may be identical with Judah ben Moses, a disciple of Rashi who is cited by Abraham ibn Daud in his "Sefer ha-Ḳabbalah" as having taught in Narbonne. Gross, Gallia Judaica, p. 214.